I have a fascination for the fantasy genre. Fantasy provides a unique medium through which to explore themes like redemption and destiny and objective morality. Fantasy also teems with dragons and wizards and heroes. In other words, it’s got pretty much everything. As I’ve mentioned in a previous post, fantasy has branched out into roughly several million subgenres: high fantasy, low fantasy, dark fantasy, steampunk fantasy, urban fantasy, magic realism, paranormal romance—the list goes on and on and on. One of my favorite subgenres of fantasy also happens to be a series of video games. I speak, of course, of Final Fantasy. Fantasy might have a ridiculous number of subgenres, but Final Fantasy doesn’t seem to fit any of them. It basically creates its own. A good word to describe the Final Fantasy games would be eclectic. The games take many wildly different elements—elements that simply should not make sense in the same story—and somehow weave them together into compelling narratives. Soldiers wielding swords ride motorcycles. Scientists in research facilities study magic and genetic engineering in neighboring laboratories. Heroes are confronted by robots one moment and dragons the next. A hodgepodge of elements from fantasy and science fiction are combined to create worlds that seem quite believable. I saw worlds, plural, because each Final Fantasy game takes place in an entirely different world. This means each game features a new plot, setting and cast of characters more or less unrelated to any other game in the series. Each game is its own adventure. There are a few common threads throughout the Final Fantasy series. Reoccurring elements include creatures, names, terminology, plot devices and themes. The themes of Final Fantasy are noteworthy as being surprisingly deep. The series deals with diverse moral, philosophical and ethical themes: everything from nihilism to environmentalism. Apart from the fact that the games are fun to play, arguably the best thing about Final Fantasy is the characters. Whether seeking revenge, striving for redemption or grappling with existential angst, the characters of Final Fantasy are usually complex, dynamic and memorable. The characters are also pretty cool. 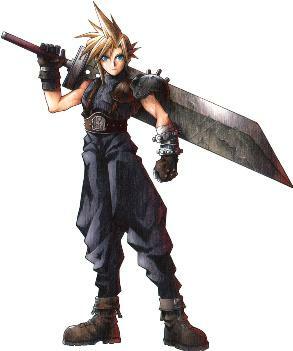 Consider Cloud Strife, equally renowned for his complex characterization and massive sword. Note also his spiky hair. Massive swords tend to be another recurring feature of Final Fantasy games, by the way. In regard to gameplay, the Final Fantasy games are quite good, though not as inspired as, say, the Legend of Zelda series. Final Fantasy offers massive worlds to explore and endless quests to accomplish, but the RPG-style battles can get a little tedious. It should be noted that the Final Fantasy games have amazing music. I can hardly resist including one more image, this time a striking portrait that goes a long way to illustrate the essence of Final Fantasy. This character represents pretty much everything there is to know about Final Fantasy. 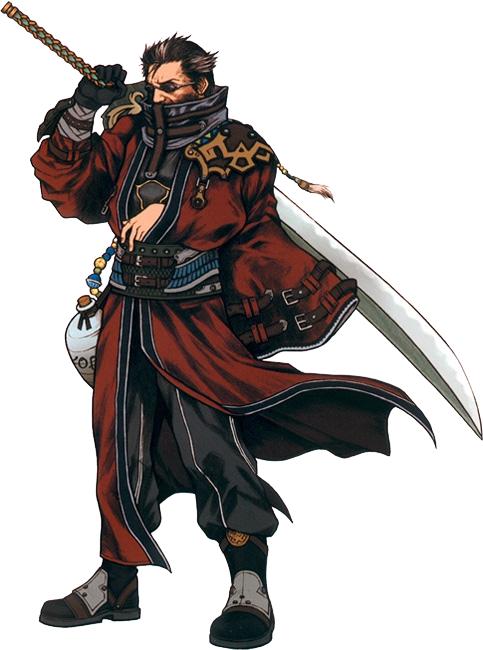 His design represents the strangely coherent blend of old and new prevalent through the series, combining stylish sunglasses with clothes that wouldn’t look out of place in feudal Japan. His face hints at deep internal struggles—in his case, unfulfilled promises—typical of Final Fantasy characters. His sword is, of course, improbably large. Although some critics argue that Final Fantasy has declined in recent years, I argue that it’s still one of the best video game series in existence. It also brings a number of excellent narratives to the fantasy genre: a contribution not to be overlooked. This entry was posted in Video Games and tagged fantasy, Final Fantasy by Adam Stück. Bookmark the permalink.